When Leah Banks heard frantic quacking outside her apartment in San Jose, California, she knew she had to go outside to see what all the fuss was about. 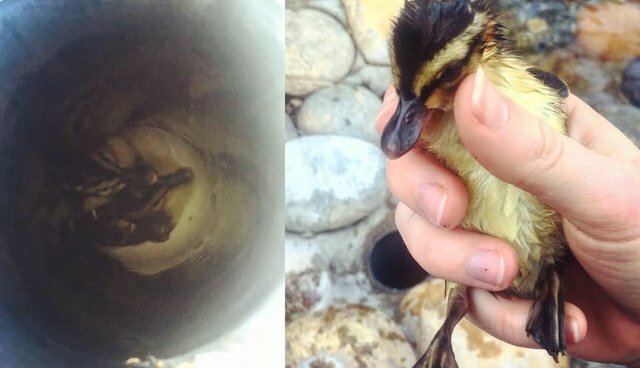 The commotion, it turns out, was quite understandable, as seven ducklings were stuck at the bottom of a pipe beside a pond in her apartment complex. A female mallard, whom Banks assumed was the mother duck, was circling nervously, her babies too far out of reach for her to save them. "I was able to reach in and pluck the first two out pretty easily," Banks tells The Dodo, "but the mama duck kept flying in my face, so I asked my roommate to help me keep her back while I got the rest out." Banks quickly learned that this was not going to be an easy job. The pipe was about 20 inches deep and quite narrow, so she kept getting her arm stuck. She even had bruises the next day. So her next idea was to construct a makeshift lasso out of yarn to haul out the remaining ducklings. Unfortunately, the yarn trick didn't quite work. "It kept getting stuck to the side of the pipe so I gave up on that," Banks says. "Occasionally, one duckling would pop its head up to bite me. The last two were too far down to grab and kept going down the other end of the pipe. They were very cold and wet so I was doing my best to work quickly." The apartment complex's manager and a maintenance worker came to help, using a claw-like plumbing tool to fish the ducklings out. 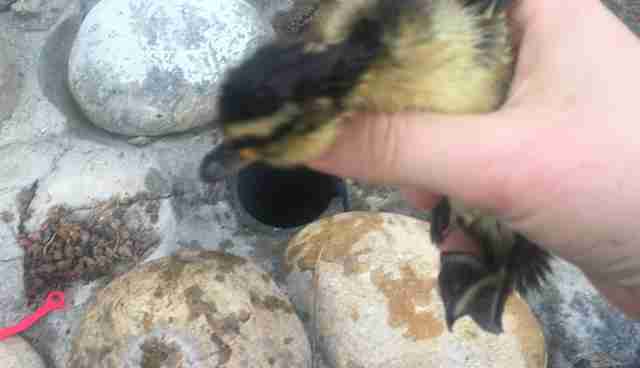 When that didn't succeed either, they eventually decided to give up, with two ducklings still trapped. But Banks persisted. She finally found a strategy that worked: splashing water into the pipe, waiting for the ducklings to pop their heads out and then scooping them out with a pair of plastic tongs. 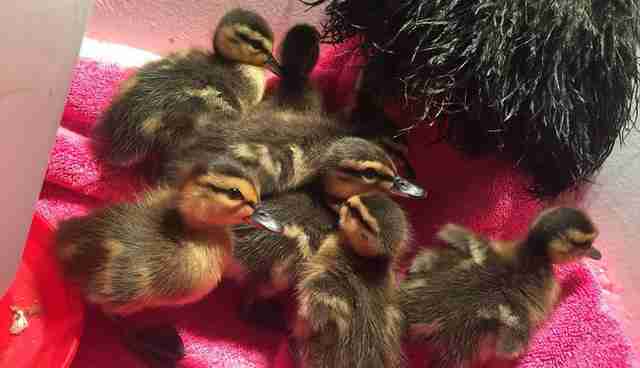 And then, finally, all seven ducklings were free. 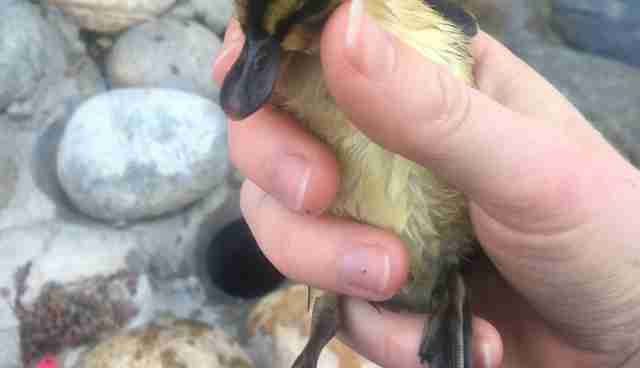 Banks shared the tale on Reddit, where people eagerly chimed in with their own duck stories. About an hour later, Banks returned to the pond to make sure she hadn't missed any ducklings in need of assistance. 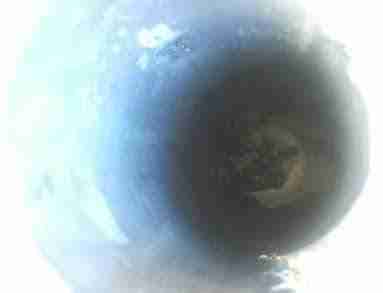 The good news is that no more were trapped - and the pipe was covered with rocks to prevent further accidents. The bad news? She heard tons of frantic quacking and splashing and saw the mama duck chasing after one of the smaller ducklings. "She caught up to it and started biting its body, holding it under water and shaking her head. She was definitely trying to drown it," Banks says. Though this doesn't seem to be a normal behavior, mother ducks will often abandon a duckling who is sick, injured or a late hatchling. "The duckling kept trying to swim away, but the mama duck kept grabbing it and throwing it against the rocks. It was really brutal to watch." Time for duck rescue, part two. "It swam to shore to get away and I found it shaking in the bushes where I've seen cats before," Banks says. "I know I should have let nature take its course, but it was just so sad-looking. I scooped it up and got it warm inside." After some quick research, she figured out how to take care of the duckling inside her apartment. 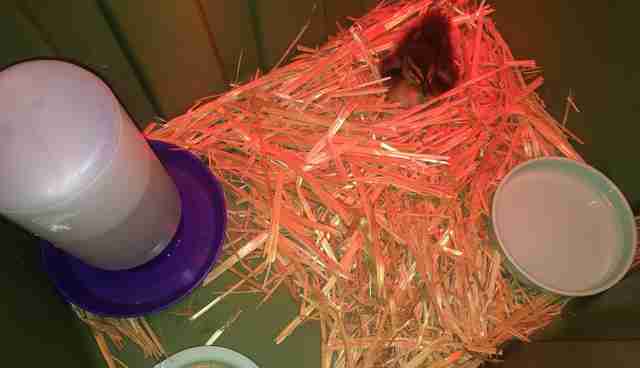 She built a temporary home for him, complete with water and starter feed. "I considered keeping it as a pet, but I would feel badly keeping a wild animal indoors." The next morning, Banks brought Piper to the nearby Wildlife Center of Silicon Valley (WCSV). The staff is currently caring for Piper and will release him in about eight weeks, when he is self-sufficient enough to survive on his own. 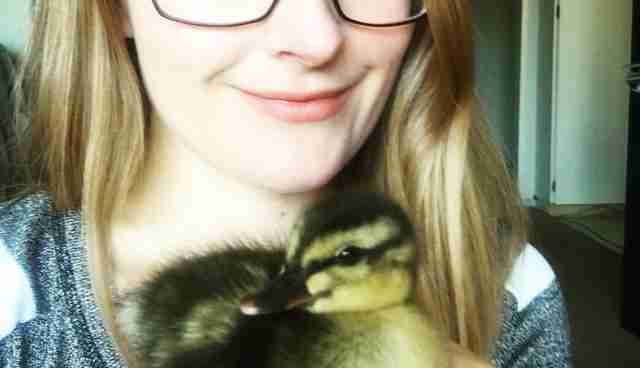 Until then, Piper will live with a group of other orphaned ducklings. They can huddle up with a feather duster, which is used to replicate the mother duck and comfort the ducklings during their rehabilitation process, WCSV writes in a Facebook post. Piper is now receiving the care he needs - but we can only imagine how tough it must have been for Banks to part ways with this little guy. If you find an abandoned duckling - or any wild animal - it's always a good idea to follow Banks' lead and reach out to a local wildlife center for help.